I’m not good at analyzing Rockstar games. I’m not good at breaking them down and showing all of the pieces, holding each one up to my eye, judging it good or bad, and then parsing it all into a good and bad pile. I’m very vocal about never being immersed in games–I think that’s PR speak that the player community has absorbed as a truth–but when I play games developed by Rockstar, I do come away with a profound sense of world and identification with the protagonist character. There’s a reason for this: it is built for me. The video game critical community spends a lot of time talking about how AAA video games as fantasies for white/straight/cis/able/middle class men, and that’s generally true for the kind of narratives and mechanics that get churned out by the industry. These narratives rarely connect with me; I don’t want to go to war, don’t want to subjugate women, don’t want to accrue capital, don’t want to lead a country, am not very masculine–I can rarely project myself into the fantasy because there’s no hook. It is never a fantasy for me. Grand Theft Auto IV and now Red Dead Redemption do, though. The hook is in not the characters–although I was drawn to both Niko Bellic and John Marston in different ways–but in the reason that these characters are acting in their respective worlds. Nico Bellic was in America, and he had to get up and get out of the squalor that his cousin put him in from day one; he did some horrible things to make that work. 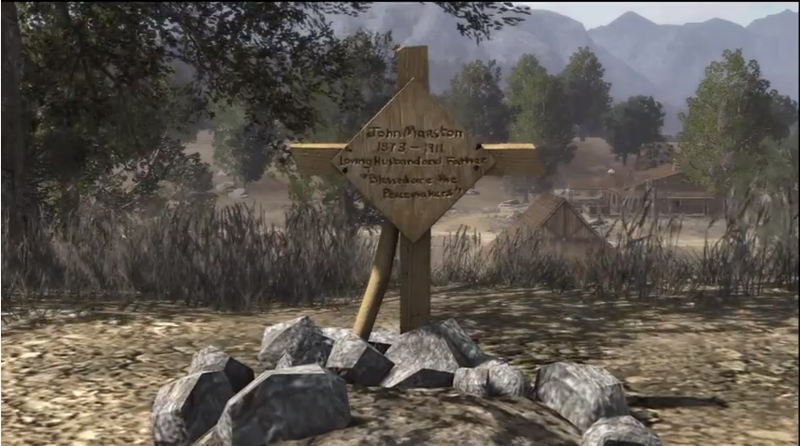 John Marston had to do it for his family, for people he cared about; he was bound to the course of things because over there, somewhere, there were people depending on him. And if he didn’t do anything, everything he could, then those people would be, at best, imprisoned for life. I appreciate RDR because it doesn’t dodge the question of why the main character is doing horrible things like killing fifty citizens and then razing their town. It wasn’t because he was suffering from psychosis or because he was being mind controller or because *finger wag* the plaaaaayer expects it to be this way, you naughty player. It is because the most important thing in his life is the people he cares about and he is both capable of and willing to do anything, anything, in order to make sure that those people are safe. What would you do to protect the people you love? Not in the advertising copy, “what would you doooooo? Would you play a corridor shooter?! ?” way, but in a The Road way. What is the limit of the human in the face of the annihilation of the only people you care about in the world? Cormac McCarthy’s Blood Meridian, a fairly obvious key source work for Red Dead Redemption, is often cited as an apocalyptic novel; Red Dead Redemption is an apocalyptic game. The destruction of everything is at the center of the game: the wild horses are reigned, the indigenous people are murdered, the buffalo are overhunted, the wildlife and killed for sport, the people are brought under the caul of violent governments. The precise balance of violence is cut down with the destabilizing precision of machine guns and automobiles and the ever-running train. Everything broken, everything shattering around him, John Marston moves from place to place and does what he has to. John Marston is a hound. John Marston is a walking gun. John Marston has no pretensions about himself. He seems to be religious and resigned to an eternity in hell for the things he has done. John Marston never stops to think that he might already be in hell. The end of Red Dead Redemption caught me, caught something in my throat. Here we are, at the end of the story, eking out an existence in this land doomed to be destroyed with pavement or with the overriding decay of time. Here we see John Marston herding cattle with his son; here we see him killing men over fifteen cows. John Marston relates to his son in the most distant way he can. There’s a buffer between them made of time and guilt and the dead, but John pursues his son’s love and trust. 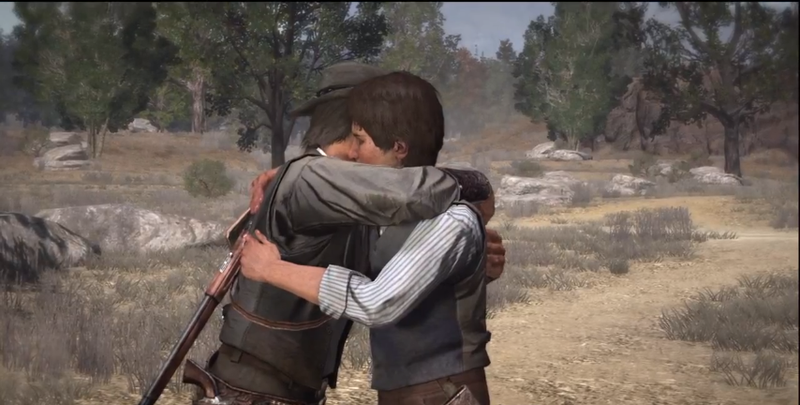 The motives of the game remixed: “what would you do for the people you love?” becomes “what would you do to make the people you love return that love?” We watch John Marston try so hard to make sure his son knows that he loves him. What makes it worse, so much worse, is that we know he succeeds. JACK: Is there anything you don’t like shootin’, Pa? JOHN: Well I ain’t met the thing yet, but soon as I do I’ll let you know. You can even put it in one of them books you read. JACK: Maybe I’ll do that–The Day John Marston Stopped Shooting. JOHN: I ain’t no literary man, but I don’t think that’ll sell. People like shootin’ in them things. JACK: I think you may be right there, Pa.
My father was a rancher as a young man. My father is loud. My father can shoot a gun and understands the world as a product and a symptom of guns. My father tells a story about watching a friend die, shot in the head. My father is apart, separated from me by a buffer that I will never understand. John Marston steps out of that barn and I think about my father, burning. Red Dead Redemption has its hooks in me, deep. This entry was posted in Video Games and tagged Grand theft auto IV, red dead redemption, rockstar games, video games. Bookmark the permalink.